The Christmas, New Year and Summer holiday season has zoomed by and I imagine that most of us are now settling back into our regular-life routines. The New Year often brings us thoughts of doing something new and making changes, but before we know it, our regular habits have us settling back into the same-o, same-o. Some of these thoughts may apply to deeply personal matters, but we are thwarted to act by a lack of confidence. Our confidence may have been knocked when we were young children and has continued to be eroded over the years. Failure reinforces our thoughts, so why should we try something that sets up that same feeling? I have seen many people start something new, with a fresh blush of hope, only to stop within a few weeks. 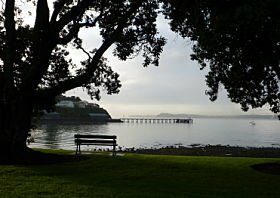 It has been recognised that contemplating change is an easily understandable process, and in this newsletter, there is a small introduction to this. 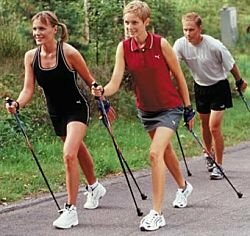 There are also three Nordic Walking-friendly events, which have been selected to encourage your participation. Desire, Awareness, Knowledge and Action ... steps to help you help yourself! The definition for change includes "an act or process through which something becomes different ... to make or become different". When change is contemplated, we go through an identifible process, which was first used when people wanted to give up smoking. "I can't, I won't, I may, I will, I am, I still am, woops I relapsed!". These are all thoughts and actions related to the stages of change. We may fluctuate between stages, but it is with understanding and the development of a strategy, that we can start on our changes. There is one enduring theme throughout the change process. We will fail, often, before we succeed. The key is to keep starting! I know a person who quit smoking 11 times before they quit for life. If you would like to discover more about your personal change process, please contact June, who is a Certified Wellness Coach. Come and join other Nordic Walkers on this non-competitive challenge. Pick your 7's distance - 7, 14 or 21 kms. This is a great event in the lovely countryside of Bombay. 5, 10 or 15kms distances available or Nordic Walkers. 5.5km, quarter, half and full marathon distances. Eliminating Bounce, Jiggle & Sway! Possibly the item of clothing that is not regularly replaced is the bra. It is quite a common sight to see exercising women, in mortal danger of concussion, because of their breast movement. 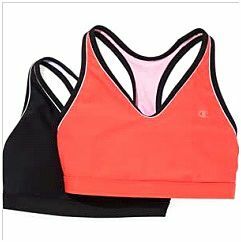 A sports bra often looks more like a crop top. It moulds around your back and ribs and fits very firmly. You may find the straps positioned towards the centre of the shoulder blade or "racer-back" style (as shown). Elastic, gel or padded underwire are used in the support cradle. A fitting specialst will ensure an appropriate choice when seeking the right fit for your shape. I often feel more comfortable in my sports bras than my "Saturday Night specials!"